With groundbreaking treatment options being discovered at a rapid pace, life for psoriasis patients has taken a turn for the better over the past decade and a half. We now know that psoriasis is not just a skin disease. Chemicals and cells involved in the inflammation have been found to be not only responsible for red scaly patches and plaques on the skin but also joint swellings, pain and many other problems. An inflammatory systemic disease, psoriasis is often associated with diabetes, heart disease, joint swellings, inflammatory bowel disease, depression and even cancer. It affects about 2.5-3 per cent of the world population; that is about 125 million people regardless of age, gender, ethnicity and socio-economic status. About one third of adult patients develop the disease in their childhood. 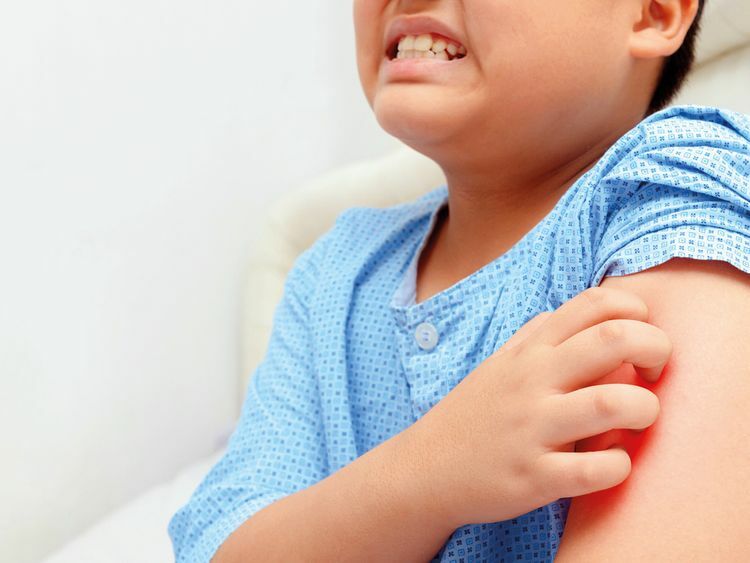 Like adults, children too get red scaly patches and plaques on elbows, knees and scalp; but unlike grown-ups, children’s face and even eyelids can get affected, says Dr Srikumar Goturu, Specialist Dermatologist and Medical Director at Dr Joseph’s Polyclinic in Karama. Paediatric psoriasis can be difficult to diagnose. Irritations that look like a diaper rash but doesn’t respond to treatment may be psoriasis. Teardrop-like scaly patches that appear on the body after a throat infection can be psoriasis too. “The management of paediatric psoriasis is more important as it is well established that children with psoriasis commonly become obese, develop blood pressure, diabetes and high cholesterol, and are also more likely to have ischemic heart disease, arthritis and even inflammatory bowel disease, not to mention the psychosocial impact,” explains Dr Goturu. About 19 per cent of the affected children get psoriatic arthritis — pain in their joints — compared to 30 per cent of the adults with psoriasis. “Good treatment is a combined effort of a dermatologist, paediatrician, rheumatologist, nutritionist, psychologist, counsellor, the parents and the child,” he adds. Various studies have discovered that the cost of caring for psoriasis patients can be more than the cost of treating heart attacks, cancers, or even serious road traffic accidents. “Recent advances in our understanding of psoriasis and the many new medications that are available have revolutionised the management of the disease,” he says. The US National Psoriasis Foundation has declared complete cure of psoriasis as a goal. Although that seems difficult at the moment, it is possible to control psoriatic disease to almost 100 per cent nowadays, explains Dr Goturu. Creams, lotions and shampoos are the first line of treatment. If the condition is severe, phototherapy is used. Amber Clinics provides all the treatments licensed in Dubai. The most modern — the biologic treatment — has been in use for four years. “When pioneering biologic treatments for paediatric psoriasis are used judiciously, they can vastly improve the quality of life of the child as well as the family.